On a Long Island beach at dusk, Bud Mitchell and Jill Winslow conduct their illicit love affair in front of a video camera, set to record each steamy moment. Suddenly, a terrible explosion lights up the sky. Grabbing the camera, the couple flee as approaching police cars speed towards the scene. 5 years later, the crash of TWA Flight 800 has been attributed to a mechanical malfunction. But for John Corey and Kate Mayfield, both members of the elite Anti-Terrorist Task Force, the case is not closed. Suspecting a cover-up at the highest levels and disobeying orders, they set out to find the one piece of evidence that will prove the truth about what really happened to Flight 800. This is what I would call a ‘dark horse’. To think that this book has been sitting on my shelf for at least 5 years and I never read it. Makes me wonder what other treasures I have in my collection. 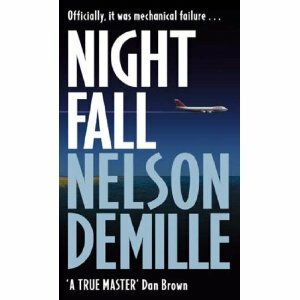 I’ve never read Nelson DeMille and have not heard of him. Such, when I was given this book, my interest wasn’t piqued and I actually read the 1st chapter but never progressed on further as I was attracted to other titles that I have and I also thought that it could not be that good judging by the title and cover. Well, it didn’t have that great a title and the cover wasn’t really that interesting too. However, I should not have judged the book by its cover :) This is a great book! Full of suspense, it has, in my humble opinion, all the ingredients that a great thriller is supposed to have – a great storyline, an interesting main character who’s both endearing and obnoxious at the same time and a twist in the plot which I always love. The ending to Night Fall is equally sudden and unexpected and really brought my attention level up a notch. While I understand that this book is based on actual incidents (both the flight and the other incident at the end), I think the author successfully painted a realistic picture of the investigations and what might have happened without drawing any conclusion. It also ended in such a way that gives opportunity to a sequel as well as new investigations on the other incident at the end which I can’t reveal without giving away the twist and interesting take on it. Could that have happened due to this particular investigation? Could it have taken place to prevent the truth of what happen to Flight 800 from getting out? Probably not but still, it’s food for thought. ‘A true master’ says Dan Brown on the cover. I agree.